My package from ElleC, won courtesy of her first giveaway, arrived today! Woot, woot! Three gorgeous vintage patterns, in more-or-less my size. Also, see that pattern on the left? Simplicity 3965? Not only is it Simplicity (so I might actually know my alterations already), it’s the very same pattern the Sewaholic has made up into so many awesome versions! 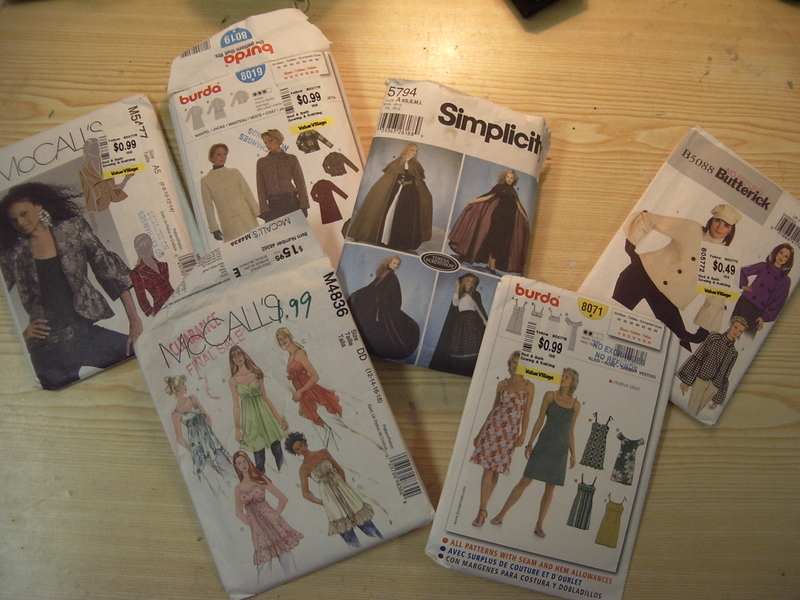 I love that the Butterick pattern comes with the opera-coat pattern, as well. In other news, after my big score of vintage patterns the other week, I’ve been stalking the pattern section even more religiously than usual. 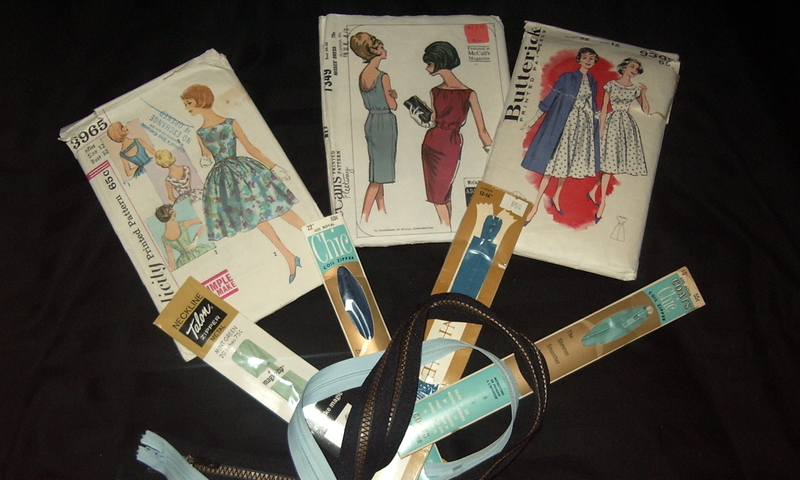 Sadly, that lode of vintage awesome seems to have played out… I’ve picked up a few patterns since, but they’re all of the slightly-dated-but-still-potentially-usable variety. Including a couple of Burdas. My ongoing weakness for jacket & coat patterns is in evidence (OK, the sleeves of that Butterick jacket on the right are crazy, but I’ve been wanting a basic raglan-sleeve coat pattern for a while…). Also my weakness for romantic sundressy things. And the cape pattern? Well, I’m bound to want to sew a cape at some point, right? Of (perhaps) slightly more interest is this 1981 pants pattern. Holy High Waists, Batman. No, I haven’t completely lost my marbles (well, maybe)—it’s a Palmer & Pletsch pattern complete with loads of fitting tips & instructions. The view on the left, I gather, is meant to represent the gingham muslin they recommend you make. Will I use it? No promises. But it was the right size and too interesting to pass up. Those ladies definitely make high-waisted look good… just not convinced that I could do the same. You can never go wrong with a cape pattern in your stash for future Halloweens. I wasn’t quite sure until I opened the full picture if McCall’s 4836 was a shirt or a nightie. ElleC has very good taste. Those are lovely patterns. Nice pattern haul! I also have a weakness for coat/jacket patterns and costume patterns, so I heartily approve of your finds. Oh, and I bet the Simplicity 3965 would look great on you – I hope you make it! Nice! Looks like you are all set for future sewing. Nice plunder! If 90210 doesn’t get you ready, how about some old Charles Angels? Now I want that Simplicity dress! I’m also interested in the McCall’s 4836 — you know, if you decide you don’t want it. Or something. I’m just saying. Hey, the 90s is still my favorite decade in fashion. ElleC is amazingly generous, given how much she dislikes you. Dude, you HAVE a basic raglan sleeve coat pattern already. omg I want that middle dress from the ones ElleC sent you. Lucky duck. I think some high-waisted sailor-esque pants would look pretty awesome on you with your long legs! And at least you’ve made some coats with your patterns…I just collect them and stare at them and then make some more sundresses. That gift is amazing! Good for you. Oooo how lovely. I like the look of the McCalls one in the giveaway pack (lovely pack too, lucky you) – it looks like there’s gathering around the neckline? Could be very cute. I can totally see you rocking the McCalls pattern in the middle from the giveaway! So sweet the back neckline! 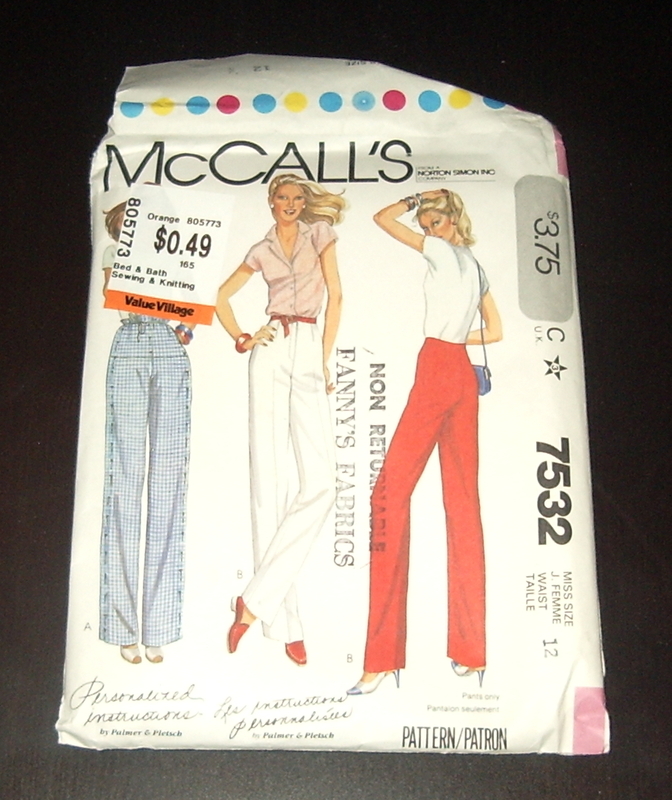 Love the McCall’s 7349. Loveitloveitloveit!